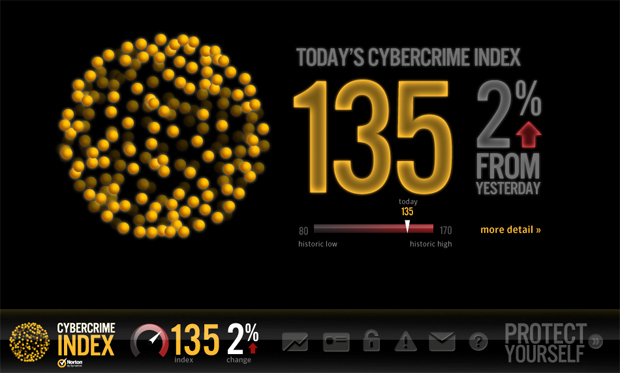 “YOU ARE AT RISK OF CYBERCRIME,” warns Norton’s new Cybercrime Index. Thanks to the bold and clear distinctions of the Homeland Security Department’s innovative, color-coded (and recently retired) terror alert system, the American public was able to react in a practical manner to threats to our national security. If the terror alert level was set to red, for example, we were under a “severe risk” of terrorist attack, meaning we might think to dial up Jack Bauer for help. If orange, we were under a “high risk” of an attack, and, well, might want to give Jack another call. And, if set to a yellow or blue alert–a “significant” or “general” risk–we might yet again think it appropriate to give ol’ Kiefer a ring. Using sleek visuals, the Cybercrime Index offers trends in spam, fraud, malware, ID theft, and more, providing users with alerts for potential Internet hazards, including the most hijacked search terms and the day’s top scams. “Our goal is to have people add the Norton Cybercrime Index to their daily routine to get a clear understanding of the dangers that are threatening them online, and to take preventative action to avoid falling victim,” said Norton’s Adam Palmer in a press release. Indeed, it’s cause for great concern if during my daily check of Norton’s alert system, I notice cybercrime is up just a couple notches. As soon as I realize the Internet is even 1% more dangerous than it was yesterday, I immediately slam shut my laptop in a cold sweat, chuck my iPhone out the window, hug my bunny rabbit Patrick, and send a telegram to John McClane circa Die Hard 4 (the one where Bruce Willis saves the world from cyber terrorists). “YOU ARE AT RISK OF CYBERCRIME,” Norton’s Index shouts when first opened. So buy more of our products!